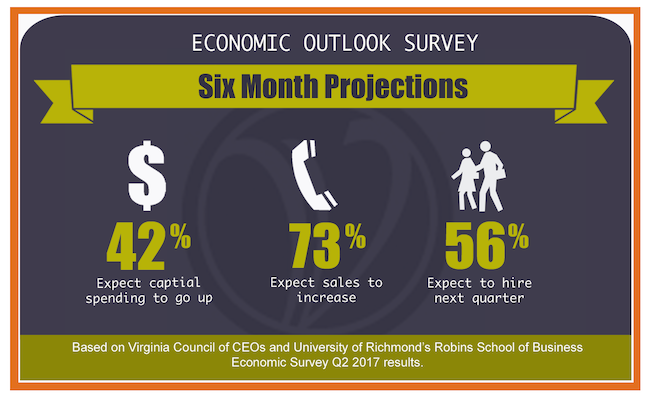 The second quarter 2017 CEO Economic Outlook survey finds that the level of optimism among central Virginia CEOs remains near the highest levels seen in the survey’s seven-year history. The survey’s index, which measures executives’ views on projected hiring, capital spending and sales over the next six months, was the third-highest ever, surpassed only by the two all-time highs reached in the previous two quarters (Q4 2016, Q1 2017). The survey has been administered quarterly since 2010. Multiple industries are represented in the sample, including construction, manufacturing, finance and insurance and retail.